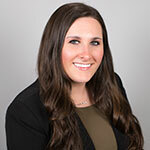 Robin is an outgoing, detail-oriented Recruiter with over 3 years of recruiting experience, having started at an international agency and then moving to Friedman Williams in 2015. Robin graduated from Rutgers University with a Bachelor’s in Human Resources Management in 2014. Robin recruits for the Administrative Support and Accounting & Finance divisions. She very much enjoys working on senior-level opportunities and, more importantly, building long-lasting relationships with clients and candidates. When not recruiting, Robin is spending time with her triplet siblings and attending concerts.